The command will calculate average value of marks considering all the marks of the table. We can define some header like this also. Here we can use the Group By command to find out the average mark obtained by each classes. Please see the SQL SUM command to know the details on uses of GROUP BY command and the precautions. Now we need to calculate average mark of each student. Similarly we will display the total mark of each student with marks in all subjects. For this we will use different student table and dump of this table is available at the end of the page. Here is the query. Updating average mark of each student and class average mark in same table. Against each student we will store average mark of the student in three subjects and also the class average mark. We will use LEFT JOIN to join same table along with GROUP BY Query command to get class average. You can download the MySQL dump of the table with sample data here. Adding average mark of each student. We used LEFT JOIN to join the same table and get the average mark of each student. 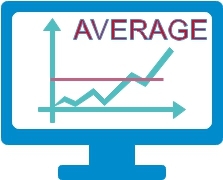 Now we will store the class average against each student by using GROUP BY Query. We have one table with product and price. There are four records (entries ) out of which three times we paid price at 10 ( on Day 1) and one time paid 20 ( Next Day ) . The average price of this column will be 12.5 as per this query . This is the average value of ( 10,10,10,20 ) which is 12.5. But average price of two days is not 12.5 , so now we will chage the query by taking unique price by using DISTINCT query. The output is 15. Now we get the correct output as average price considering first day and second day price. This is equal to average of 10 & 20. Inserting Average mark in a new table. We can store the average mark of each student in a new table for report generation. If there are some null data then how that change the average value? ( it is not equal to 100 / 4 =25 ). Note that null data is not same as 0 data. Null data is ignored in average calculation and removed from total number of records. We can display records starting with highest total mark and following with next total mark and ending with lowest mark. We will use Order by SQL for this. Here is the sample code to use the above SQL and display the records. Here we have already connected to MySQL database. We can add SQL FORMAT to restrict the decimal places in above query. Here is the modified Query. Other sql commands like between can be used along with this avg command to find out required results. please I would like to know how to sort a database student average score in result processing?